to start this review – but it will make sense later. I will talk about Kahlla and how her international and varied past have contributed to her sound. I also want to look at how songwriters compose and what inspires their process; how honesty and revelation in song can work so long as there is substance in the song; those who are primed for success years from now – I will end by looking ahead to Kahlla’s future and where she can head. The reason I want to slightly go off the road to start is because I am listening to music right now and there is not too much that is catching my ear. Sure, I like bits and pieces coming out but there is relatively little that remains in my mind and gets under the skin. I have tried explaining this and trying to rationalise why I feel a bit distant from music but I think it is the sheer weight of the industry and how hard it is to stand apart. I am listening to a lot of David Bowie and his work prior to his ‘Berlin Trilogy’ – Station to Station is an album that I love and does not get talked about as much as it should. Bowie was always innovative and looking to take his music in different directions. Even though he was not always perfect when it came to quality, you could never call him boring and he never liked to do the same thing. I look back at the icons and innovators because they have made their mark and should act as a guide to the new generation. I wonder how many modern artists are learning lessons from the legends of old and actually realising why they sustained and continue to be talked about. Whilst it would be unfair to compare Kahlla to David Bowie, I think she (Freya Volk) is someone informed by different cultures, experiences and movements. So many artists simply stick with the same sound or do not really evolve between releases. She was born in Amsterdam and raised in Germany – she now lives in London. I can hear the internationalism in the music and different parts of her life in every track. Like big artists such as Bowie, you get this sense of different nations and people; a more open mind and artistic soul. Stick with me on this one but I think Bowie succeeded and was so inspired because he travelled and integrated different genres into his core. Too many artists now are stiff and not willing to open their horizons. Not only does Kahlla give us impressions of different landscapes and views but the way she writes about herself and experiences is bold and honest. Kahlla left her rural home at the age of eighteen but I feel that time was instrumental to her. If she started life in the city and did not make a leap then I think her music would sound very different. I think it is the different settings Kahlla has lived in/around that has enforced her ambitions and inspired her sounds. One gets a sense of the vulnerable with Kahlla and she opens her heart to the listeners. Maybe it seems rash and hopeful thinking Kahlla’s boldness and extraordinary music can be linked to the fact she has lived in different nations – I would argue against this. If you are standing in the same spot and only have the same people around you then, unless you are very imaginative, your music will not be that broad. Kahlla has spent time in a rural setting and time in Europe. She now lives in London and a very different environment. I yearn to hear artists that have a constant need to move and grow with every release. Kahlla has a definite core sound but you can tell she is always keen to express different aspects of life and not do what so many do – just talk about love and relationships and nothing else. Her current song is about a relationship but, as you will see, it takes a different angle and is very personal to her. Another reason I have been looking back at the legendary artists is because of how they used to write. I might have this romantic impression but it seems, more and more, artists now are relying on technology and are not actually sitting down to write. Many are using apps and recording ideas onto their Smartphones and it is a quick and easy way to compose. I know a few who will literally take pen to paper and others who are influenced by scenes around them – they photograph what they see and that translates to songs. Look at Kahlla and, in many ways, she has that romance and tradition of the older songwriter. I get the impression of the classic artists scribbling notes and projecting this very idyllic and peaceful scene. Maybe I am naïve regarding the process but things have definitely changed a lot. So many are hurrying and jotting notes between jobs and not having that much time to sit and write music. The reason Kahlla’s songs sound so complete and evocative is the way she writes and the attention paid. I like the fact there is a mix of the modern and old-fashioned when you look at her. Her music projects the impression of someone who is aware of the demands of the market and what music is popular but look at how she writes. She can be caught wandering the London streets armed with a disposable camera. Not only is it rare to find a shop that still processes photos but how often does one see anyone taking pictures the old way?! It is a charming and authentic aspect to her personality that sets her aside. I am not sure whether Small relied on photos and capturing special scenes but it is clear Kahlla is a step apart. She does not approach songwriting in a very clinical and formulaic way. I think so many songwriters are like that and their music seems to replicate a common pattern or algorithm. I think many fear they will struggle for success and quick appreciation if they do not follow the pack or write something that is similar to everything else. Kahlla builds collages from pieces of her life and arranges them into the music. These soundscapes and striking pieces are as a result of her taking these photos and freeing her mind. She is very honest and open through her music but she is not a songwriter who simply writes about love and heartache in a very predictable way. One gets a real sense of a unique artist who wants music to be much more immerse and captivating than simply listening and walking away – she wants to bring you into the music and ensure you are walking alongside her. Kahlla was classical trained and spent time in Punk/Rock bands. She digested as many shows as possible and got a really eclectic upbringing. Again, this is similar to a lot of the legendary artists who, naturally, would evolve and shift between albums. I also want to look at how songwriters compose and what inspires their process; how honesty and revelation in song can work so long as there is substance in the song; those who are primed for success years from now – I will end by looking ahead to Kahlla’s future and where she can head. Maybe my comparisons to Bowie were not rash and there is something in that. In any case, both of them are informed by their past and other nations – both have an attachment and link to Germany – but it is that artistic approach to music that is why I mention Bowie. He almost approached music like a canvas: not beholden to a set formula and style, he was this artist who was keen to stand out and not be easily defined. His various impressions and creations were staggering and, when I look out at the modern landscape, I do wonder whether there is any real sense of preserving that discipline. I am not sure whether Kahlla is inspired by artists like Bowie and Can but you can sense a connection. She has been influenced by years of poetry and a ‘bare-all’ style of lyrics. In many ways, each song is a collection of photos that document a very particular point in life. I love the idea of Kahlla walking around London in all weathers being moved by things around her. Whether a wintery scene or an unusual human; a perfect sunset or a very strange bit of graffiti – it all makes its way onto film and into music. Kahall is very into art and someone who is keen to express in a very evocative and physical way. Like me, she has a few tattoos but, unlike me, she has a real passion for tattoo art. She is a very striking woman in any case – my way of saying she is incredibly beautiful – but one is stunned by her tattoos and the fact that she stands out in a crowd! One would definitely not forget Kahlla is you saw her and she is fascinated by art and culture. In many cases, she has already conceived artwork and the videos before a song is finished. Again, here is an artist who is much more involved in songwriting and approaches it from a visual and imaginative standpoint. I do think a lot of modern songwriting is quite procedural and predictable and there are very few that view music as art. When she talks about love, that is not to say Kahlla is abstract and detached. 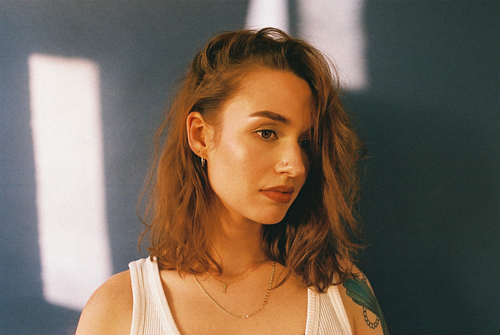 Instead of being very stark and colouring by numbers, Kahlla talks about heartache and being overlooked in a way that mixes emotionally honesty with something quite colourful and artistic. 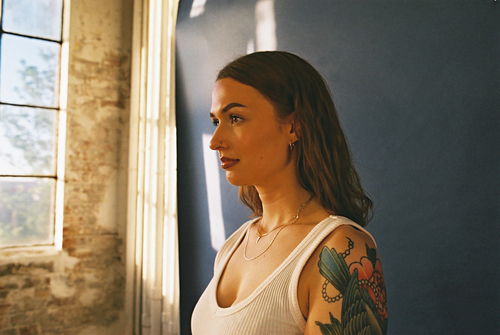 In ways, she is similar to female trailblazers like Lapsley and Phoebe Bridgers. One definitely can hear similar melodic sensibilities and a fresh, exciting approach to songwriting. What one gets with Kahlla is a definite personality. That might sound strange but she pops and resonates. Too many artists are unattractive on the page and you are not compelled by their past. Kahlla is a fascinating songwriter and someone whose creative process and imagination draw you in and keep you hooked. I am not always a fan of artists talking about love because, a lot of the time, there are clichés everywhere! I do not mind hearing about heartache and doubts so long as there is something different to be found. I have heard too many wracked and over-emotive songs that drain the energy and leave you cold. Kahlla is the same as us and goes through hard times and has to fight against doubters. Instead of being defeated and deflated, she has this strength that resounds and sparks. She is confident in her own skin and knows how strong she is. Small is about someone close who doubts her strength – whether a family member or her boyfriend – but Kahlla knows not to take the words too seriously and believe what that person thinks. We can be made to feel inadequate and small. Whether it is someone we do not know well or a family member, it is hard to take in and can dent the spirit. Rather than believe that and let it get to you, that determination and fortitude is important. Kahlla uses this truth and direction to create inspiring songs and provide something genuinely uplifting. One gets the drum machine-led groove and soundscapes that bring in her Classical music background. It is the way she marries these rather different sounds together and comes up with something natural and unexpected – a songwriter who is taking risks and seeing them pay off. In many ways, Kahlla is the artist we need in music right now: a brave, innovative and fascinating character who will inspire many. Whether Freya Volk’s alter ego is an exaggerated sense of who she is – like Bowie and his Aladdin Sane – then I am not sure. What we do know is that Kahlla is truthful and, when it comes to matters of the heart, we are hearing Freya Volk write without disguise. Artists who obfuscate and blur their own reality behind metaphors and lies will never resonate like those who are very open and true. Kahlla might be a creation and invention but what we hear and experience comes from the woman behind her – with no sense of fantasy and lies. This is important because I find it hard to bond with many modern artists. I want to feel connected and as though I am listening to words that explain who they are and what drives them. Kahlla, on Small, battles against doubt and those who want to put her down. It will be interesting, when I get to the song, seeing whether the perspective is from a lover or someone in her family. It is a great inspiration for a song and something we can all relate to. Let me get to the song now and not leave you waiting too long. I wonder whether there will be a video for Small because I can imagine a very vivid and memorable outlook. I would love to see what Kahlla comes up with because, as the song opens, I already started to picture scenes and the storyline – as Kahlla often envisages videos when writing songs, I am sure she has something in mind. There is almost something Jazz-like and classic about the opening of Small. Too images come to mind when hearing the opening lines. For one, I imagine the heroine in a club in the 1950s playing to this smoky room. There are no other sounds and she is under this spotlight and closing her eyes – letting her soul out and lost in the moment. The other vision I had was of Kahlla in her room with the rain beating down. She is alone but thinking about harsh conversations and troubled times. I do not know whether the song relates to a previous lover or her current boyfriend – if, indeed, she is seeing someone – but I got the view a sweetheart was in her mind. Maybe that is rash but the opening lines find the heroine wondering if she needs approval and support. Kahlla feels like they are not on her side and she really wants to be who she is – it is hard at the moment and she wonders why she cannot toughen up. Strength is not something Kahlla is lacking and I think she has plenty of guts and strength. What is most impressive about the song is how sparse the composition is. Kahlla’s voice is allowed to reign and there are a few piano notes in the background. The voice is very much at the top of the mix and it is smoky and dreamy. One can imagine Kahlla very close to the microphone and with her eyes closed – in a very intimate setting with some low lighting. The vocals soon layer and we get this sort of mix of direct and disembodied. I like the fact the transition is quite gradual and we are not overwhelmed with sound and rush. Beauty and tenderness are present but you can feel the hurt come out. Again, I was thinking of a relationship but the words might relate to family and friends. It is hard not to think of Kahlla and her boyfriend on different pages and separating. Maybe it is an older relationship but the words sound fresh and urgent. It is clear, whoever inspired the song...they do not have faith and are not providing that support. The heroine is left to wonder whether she should go her own way and trust what is being said. She is being made to feel small and bad and this is getting to her. Kahlla knows she is strong and worth more and I do wonder how the situation came to be. Maybe there is a natural breakdown and disconnect and one is left to wonder. I feel like the other party has not been committed and is taking Kahlla for granted (I should say Freya). The heroine has been stung too often and made to feel like she does not matter. Instead of striking back against them, Kahlla has that self-belief and knows she is worth a lot. The earlier piano notes are replaced by fresh beats that click and patter with immediacy. Kahlla also does not keep the vocal projection static and, instead, moves and twists. At one point, there is this syncopated rap that is unexpected but seems to give the words even more weigh and reality. At another moment there is an almost seductive delivery and the fact we get this mixture and change keeps the song mobile and original. I hear a lot of artists who do not consider pacing and delivery but Kahlla ensures Small is always moving and never gets predictable. She is questioning her mind and wondering whether she should place any trust in her once-treasured support. It is hard to break away from someone you love and trusted but it would be foolhardy to bury anger and stay with someone who does not respect you. When Kahlla is at her most seductive, beautiful and evocative – the vocals layer and the words rise to the heavens – I think about the cover art for Small. 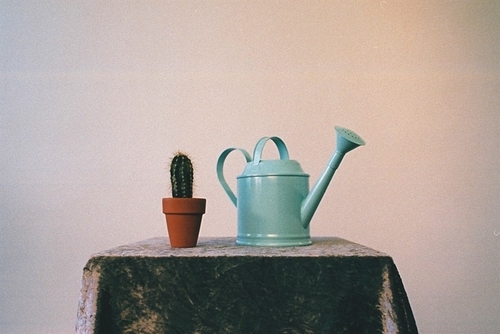 The image is of a small watering can and a cactus. I think of this dry and desert-based soul who used to rely on this nourishing water and substance but does not have that anymore. Maybe she needs that watering or feels like she is deserted. Maybe the sweetheart is this prickly plant and she is the life-giving force. Maybe I am over-interpreting but I feel like there is a connection between the visual image on the Small cover and what the song is trying to say. Even though she is letting her heart beat strong and asking hard questions, the vocal is light and beautiful and one gets a real rush and physicality. I do love how there is that balance of raw and hard-hitting lyrics and a composition/vocal that is soulful, rushing and explosive. Kahlla feels small in her shoes and she knows she is worth more than that. The heroine is asking questions and searching her mind but you sort of hope she will move on and not made to feel inferior. Perhaps there are issues that can be resolved but I think, when you are at the stage when you are being belittled, it is tough to come back. Maybe, again, I am thinking too much of love (rather than family) but what is left when you take away that trust? There is a physical connection and passion but the core of a relationship is trust and respect – it seems like this has been taken away. If we are looking at family and friends then that bond is important and you cannot break it. Instead, there needs to be some harsh words from Kahlla – informing them that she is not to be taken for granted and made to feel small. By the end of the track, you hope Kahlla is okay and she has been able to find some peace. One knows she will be okay but it is quite sad to realise she has been put in this situation and made to feel like this. Let’s hope whoever has committed this sin has either been spoken to or removed from her life! I have covered Kahlla quite extensively and the woman behind her, Freya Volk. I will write a bit more because I think there is a bright future for her – and I forgot to mention something at the top. In many ways, Kahlla is this almost-flawless person. You have this very confident and stunning woman whose beauty and grace and matched with a strength and sense of rebelliousness. Her love of tattoos and artwork goes beyond her body and soul – one can feel images and art flowing through her songs. Kahlla’s music is accessible and original at the same time. You can bond easily with her but never feel like we have heard it all before. The way she mixes more Classical edges with Rock and Pop elements is fantastic. It is still early days for her but all the signs are very positive. I wanted to mention her voice and how that makes me feel. Maybe this is me getting a little gooey-eyed and smitten but it is another aspect that buckles the knees and gets into the heart. I am discovering a lot of great Pop around but the vocals seem somewhat distant or routine. I want more explosion or passion; I need that delicacy and tenderness when required. So many artists have a narrow emotional palette and their performances can come off as colour-by-numbers and flavourless. On Small, you get all these different shades and emotions and there is so much beauty to be found. Not only that but one is instantly bonded to Kahlla because there is this rawness and strength that inspires. She packs so much into the performance and, together with the excellent composition; it means you’ll come back a few times just in case you missed something! This is rare to find and another reason I believe Kahlla will go on to have a bountiful and bright career. So, then...what comes next for her and what does the rest of 2019 hold in store for the multi-talented songwriter?